In Campbells Andersen’s old factory premises, at the edge of the bridge in Damsgårdssundet, a number of fishing gear was previously produced. Now, BOB’s new venture will be here, where two buildings with a total of 41 apartments will be built. Building A (Damsgårdsveien 77) is being erected and replaced by a completely new building over 3 floors with 11 homes. Building B (Damsgårdsveien 79) allows for 30 new apartments. In addition, there will be parking for cars and bikes on the 1st floor. 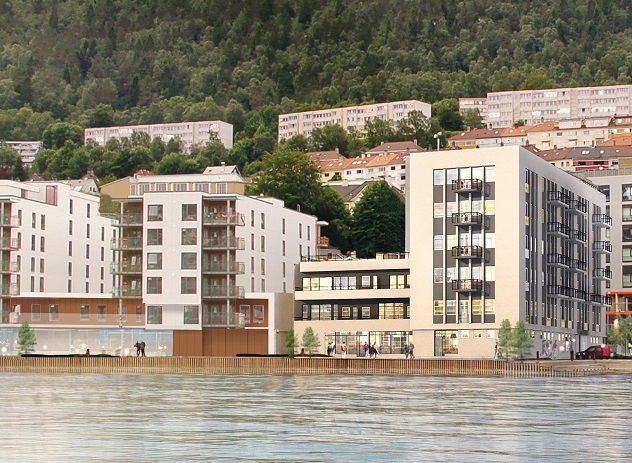 Brødrene Ulveseth As is engaged as a contractor for the project and Jotne Ankers will provide 19 balconies with linderud glass rackets, 12 pcs. French balconies, 185 meter glass trusses (linderud), spiral staircases, concrete slopes and exterior steel staircase. Completion of this project will be the 1st quarter of 2019.